All play and no work makes Jim a dull boy. We played tennis a couple times daily in Arizona. When we weren’t playing tennis we were hiking or hanging out at the swimming pool. It just didn’t seem like there was much time for projects at Towerpoint. Lots of playing, not much working. We’re in Okeechobee FL now and Jim’s finding time and inclination to get a few projects done. 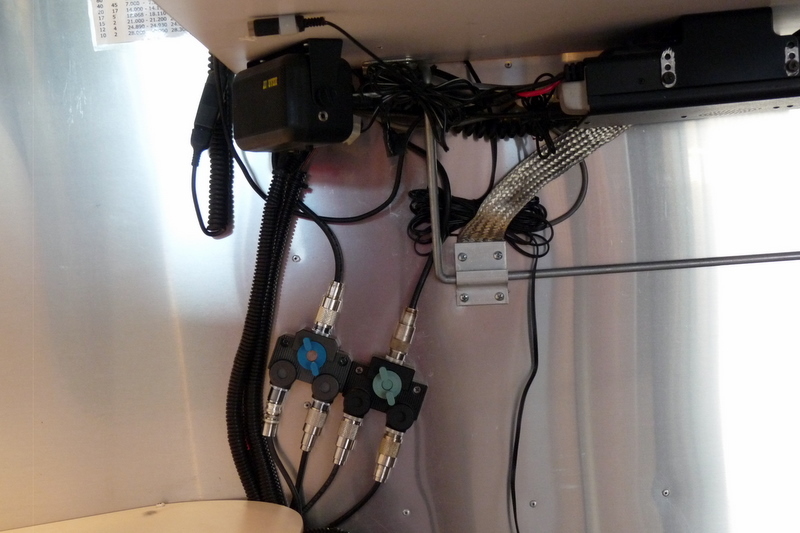 So today Jim worked a little to clean up some excess coax wiring in the trailer. 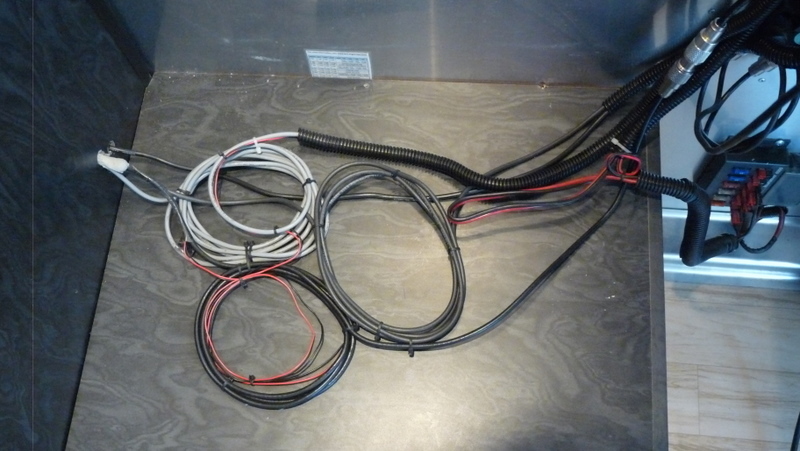 Yesterday he built a couple of 12″ coax jumpers for connecting antenna switches to the ham radio. Today Jim removed one of the dinette benches (the one over the wheel well and against the refrigerator chase. 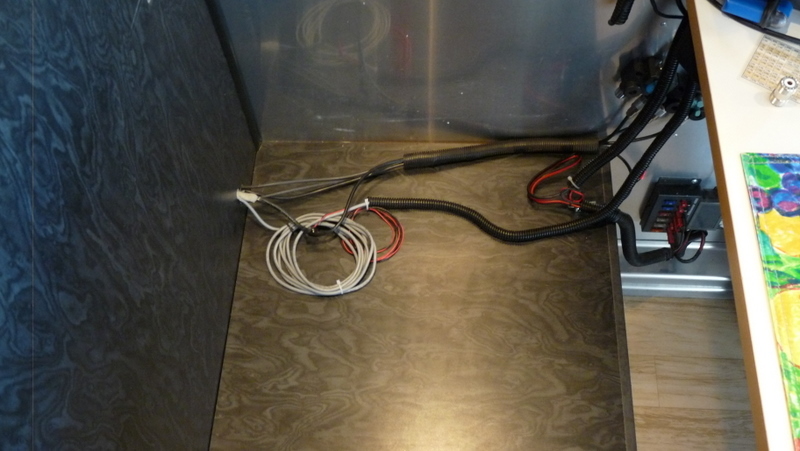 Since he first routed coax cables under the dinette it has been a big mess. For a while coax and power wires would slide forward and onto the floor. Jim took control of the excess wires last year by coiling and tying them under the bench. Today Jim cut several feet from each of two VHF coaxes and five feet from one HF coax. Result? Not much change in signal, losses on only three feet of coax are negligible. The coils might have been doing no good, we don’t need any chokes on our antennas. Main effect is housekeeping and freeing up more scraps of coax. And, Jim installed the second antenna switch today. We bought this at Hamcation last month and waited until today with cleaning up cables routing. An antenna switch is great for alternating between two antennas without unscrewing and refastening coax to the radio. This is particularly helpful when the radio is mounted against the underside of the table. No more sitting on his knees and trying to see and feel the coax connections — just flip the switch to #1 or #2 to alternate between the j-pole and the 1/2 wave on the trailer’s roof. This keeps things simple and clean, both great things for full-timers.